We did some simulations with the previous HE FE Table, but the D6 rolls make it too random. I hope the bell curve of the 2D6 die roll will flatten that out a little. On this table, 2 out of 3 times the result will come out of the middle 5 rows, but exceptionally good or bad results are still possible. Also, rather than working with modifiers, I intend to use column shifts. 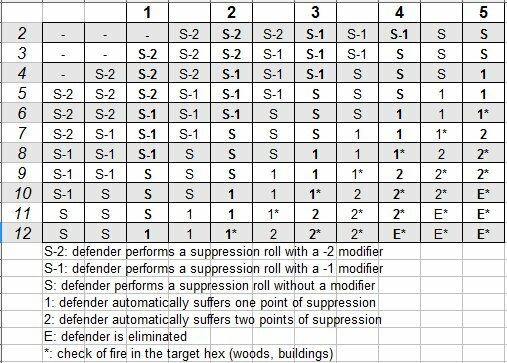 So a fire team delivers 1 Fire Strength, but good leadership, elite troops, close range may cause right column shifts (increasing the damage) just as good cover, long range or being suppressed may cause left shifts, and therefore less damage. 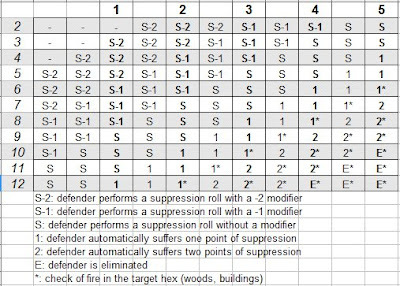 The thing I worry about is whether it will be useful to form fire groups: Will two teams with a good leader prefer one roll on the 2+ column or 2 rolls on the 1+ column? It will probably depend on troop quality, I still have to do the maths on that. 32/36 chance on a S-1 or S? Or 16/32 chance on a S? Will a leader influence only one team? That would even the odds somewhat: In order to have more units benefit from leadership, they would have to form a firegroup. Then the result would be 2 S-1 results versus 1 S result. For a Q3 target, two times 33% chance they incur suppression, or one 50% chance, plus a small chance of fire. Or do I change the suppression checks to 2D6 as well? I hope to get some units ready after Nikfest in December, so we can test a bit more thoroughly.